Sometimes you can't borrow a title immediately, usually because another user has already borrowed it or the title hasn't been released yet. If so, you may be able to place a hold on that title and receive an email when it becomes available for you. 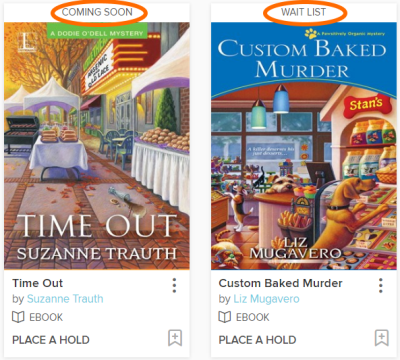 Titles that can't be borrowed immediately have banners saying "Wait list" or "Coming soon" along the top of the cover image. To place a hold on a title, follow the steps below. 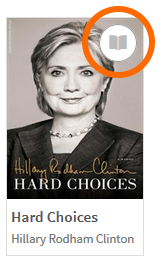 Click or tap Place a hold under a title (or on its details page). 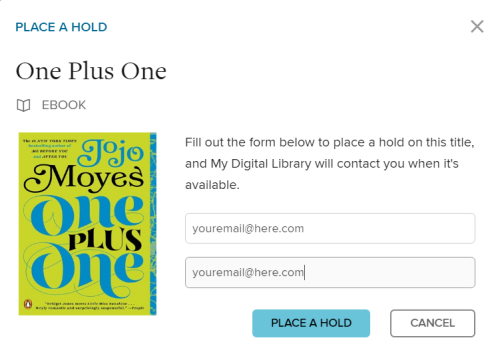 If you've already provided your email address to your library's digital collection, the hold will be placed automatically. You'll be notified at that email address when the title is available for you. If there isn't a saved email address for your account, enter and confirm one when prompted. Then, select Place a hold. When the title is available, it will be automatically checked out to you. You'll receive an email notification letting you know that it's waiting for you on your Loans page (under ). 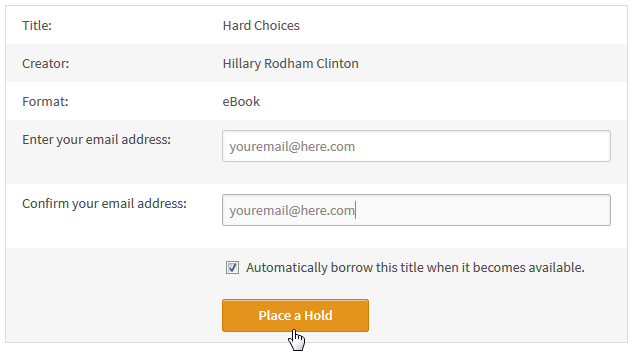 If you don't want your holds to be automatically checked out to you, you can turn off automatic hold checkout. Sometimes a title is unavailable because another user has already borrowed it, the title hasn't been released yet, or, in some cases, because you've temporarily maxed out your checkouts for that type of content. If so, you may be able to place a hold on that title and receive an email when it becomes available. 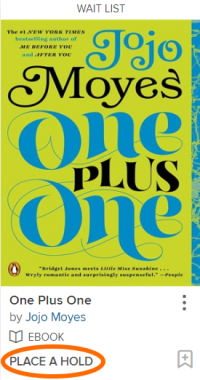 Unavailable titles have grayed-out format icons in the top-right corner of their covers. 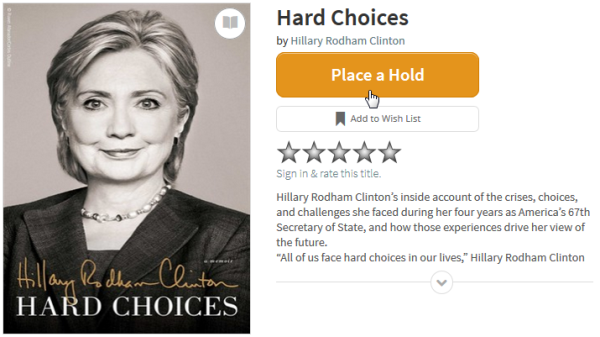 To place a hold on an unavailable title, follow the steps below. Tap or mouse over a title, then select Place a Hold. Or, tap or mouse over a title and select more to open its details page, then select Place a Hold. Enter your email address, then select Place a Hold. If you want the title to be automatically borrowed for you as soon as it's available, make sure that "Automatically borrow this title when it becomes available" is selected. Note: Automatic borrowing cannot be turned off for some titles. When the title you placed on hold is available, you will receive an email letting you know that it has been automatically borrowed for you and that you can find it on your Checkouts page. Or, if you've chosen not to have the title automatically borrowed for you, you will receive an email notifying you when it's available, and you can follow these instructions to borrow it.